If you are looking for a premium shotshell for personal defense, Hornady has the product for you. These Light Magnum shells are 2-3/4" and hold 8 pellets of 00 Buckshot that leave the barrel at 1,600 feet per second. Hornady uses a red or blue color code system for identifying magnum loads and low recoil loads. These are the red hull "hot" rounds that operate at high pressure to ensure that tactical semi-automatic shotguns function properly. 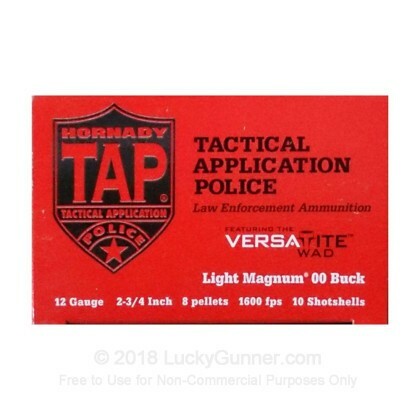 Hornady's Tactical Application Police (TAP) line of ammunition is engineered for law enforcement applications. This ammo is intended to be the most reliable and consistent product available, for when your life is on the line. Hornady created the TAP line so law enforcement professionals would have ammunition that is specifically designed for their tactical needs. Buy with confidence! If you see that a product is "in-stock" then we have the product in hand and ready to ship, that is 110% guaranteed! We don't have any reviews yet for this particular 12 Gauge ammo from Hornady. If you'd like to be the first to review this particular 12 Gauge ammo from Hornady, fill out the form below.